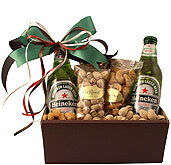 Beer Gifts Boxes – Microbrew, Guinness, Heineken and Many More! 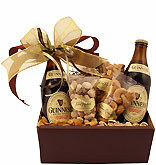 Beer is the perfect choice for all occasions and interests, and we offer a wide selection of beer gift boxes that are sure to please any beer lover in your life. We have a variety of brews available, from Guinness to Heineken to Corona, Fat Tire, Microbrews and more! 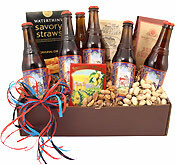 These beer boxes come beautifully wrapped and with tasty snack pairings to make your box even more delectable. We have gifts made for a day out golfing, an “Over the Hill” birthday party, Father’s Day, a long summer’s day, and many other occasions. Our boxes are themed with classic confections and decorations that are sure to make anyone smile. Available at several price points, some that include just one beer to larger boxes that contain half a dozen. We have boxes for a pair, for one, and for groups, all beautifully assembled for a beer-tasting experience. 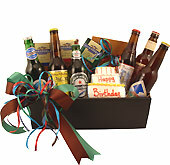 Anyone can appreciate the gift of beer, especially because we have gift boxes available that suited to every interest. 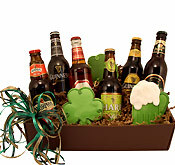 Beer box gifts are also a great way to enliven parties and summer barbecues, or to show your gratitude for that special person in your life. Beer boxes also make great thank-you and housewarming gifts, not to mention a perfect way to treat yourself after a long day! No matter what kind of gifts you're looking for or what occasion you’re celebrating, you will love our creative and carefully constructed gifts. Our boxes are reasonably priced, of the highest quality, and sure to impress. They are the perfect alternative to everyday, store-bought beer, and make a thoughtful gift for friends, family, or co-workers. Whether you’re toasting an anniversary or relaxing after a long day at the golf course, these boxes are an excellent choice that you’ll want to make again and again. 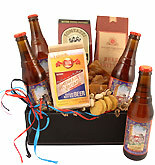 Open a bottle of Sunshine Wheat from the New Belgium Brewing Company and indulge in the complex aroma. With a foundation of citrus fruit and prominent notes of sweet malts and spiced hops, you may want to take a few long whiffs as you pour this liquid sunshine into your favorite glass. A thick, creamy head is quick to rise up, but it dies down to white lacing that sticks to the sides of your cup. The brew may fill your mouth with creamy texture at first, but the carbonation provides a burst of bubbles that deliver more of a spritz effect. While coriander and orange peel are prominent in the flavor, there's no denying the strong bite of hops that touches your taste buds at the last second. This is a slightly bitter beer that leaves you with a clean, satisfying finish sip after sip. Brewed in northern Portland and adored by fans across the country, the American-style Hefeweizen bottled and distributed today was once the flagship brew produced by the Widmer Brother's Brewing Company. It pours into the glass a cloudy golden yellow, proudly representing unfiltered beers with a slightly citrus aroma. You can also detect a touch of floral in the scent, but the taste is sweet wheat with a touch of spice. The carbonation provides a nice amount of bubbling in the glass, making it the perfect drink for a warm summer afternoon. This is especially true if you add a wedge of lemon to the edge of your glass and relax in the sunshine with good company. The Hefeweizen recipe is powered by Pale, Munich, Wheat and Caramel 40L malts, but it's perfectly balanced by a blend of Cascade, Alchemy, and Willamette hops. Available year-round, this may turn into your go-to beer when you crave something satisfying and complex. If you consider yourself a rebel at heart, you may appreciate the trademarked ingredients and pure heart that go into every bottle of Rogue Ales beer. Hazelnut Brown Nectar is a dark brown ale that's and brewed with Risk™ and Rogue Farms Dare™ malts as well as Independent™ and Rogue Farms Revolution™ hops. These unique ingredients are combined with a mix of popular malts, including Munich, Brown, Two-Row, Kiln Coffee, C-15, C-120, and C-75. 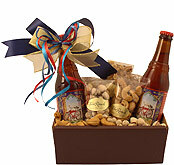 This combination creates a nutty flavor, but each sip ends with a strong malty note. As you pour the dark liquid into your glass, lean over and enjoy the strong aroma of hazelnut. This is a traditional European-style brew that will go well with your best pork or beef dish, but you may also pour a glass when you're ready to relax at the end of a long day. When the craftsmen over at the Deschutes Brewery set out to create a flavor-intense beer that was also easy to drink in a relaxed setting, they came up with a deep brown brew that is now known as Black Butte Porter. This was the first beer introduced by the brewery, and it remains one of the most popular bottles that they put out today. While you'll notice the chocolatey flavor with rich hints of coffee, it's the creamy texture of the beer that may make you crave just one more sip at the end of a drinking session. This powerful-yet-enjoyable flavor is produced by a combination of Chocolate, Carapils, Crystal, Pale and Wheat Malts, but it's the balance of Tettnang, Cascade and Bravo hops that finish off the interesting profile. This is an award-winning beer that deserves a seat at any dinner table, so dust off your favorite drinking glass. The Full Sail Brewing Company didn't intend to create just another India Pale Ale when they crafted their Classic IPA. Their goal was to brew up a tasty treat that would serve as a reward at the end of a fun day out in the sunshine. This is the kind of beer that you sip on the beach, on your front porch, or by a campfire while the sun goes down in the evening. It's equally as pleasing in the middle of the day or even mid-morning, thanks to the full body with an intense citrus flavor. The recipe used to create this brew incorporates Centennial hops sourced from the Yakima Valley and a blend of Crystal and Two-Row malts. While those malts definitely steal the sunshine, it's the fruity highlight that will make you want to relax for just a few minutes longer. When the sun comes out to play, don't leave the house without your Classic IPA. If you prefer your coffee blended with chocolate and topped off with alcohol, pour a glass of Rogue Mocha Porter and get ready for a pleasant wake-up call. Not only will this well-balanced treat brighten your morning, but you can depend on it to make a statement when combined with the richest desserts. It also fits right in on the dinner table when beef is on the menu, but you never need an excuse to energize with a fresh Porter. In good times and bad, you can count on this award-winning Rogue beer to lift your spirits. After all, it has collected more than 30 awards from the U.S. Beer Tasting Championship and other well-known establishments. Mocha Porter pours into your glass a deep brown that may appear black, and you might catch the occasional streak of amber if you inspect your glass under the right light. When your eyes are done feasting, lift the glass to your lips to see what well-balanced beer is all about. The brewers at Rogue do a great job of combining sweet malts with bitter hops without allowing one to dominate. As the light brown head fades away, the chocolate-laced coffee flavor and strong aroma will give you a reason to smile. Every sip ends on a bitter note, but there's more sweetness to come with the next drink.